When you have a good name people can trust you. That trust is a stabilizing factor in your relationship with them. They know what to expect from you and can lean on your decisions with absolute surety, knowing they were made with pure motives. Those whose good name has been tarnished have a difficult time building trust and consequently maintaining friendship. Their motives will always be questioned as insincere. They are more or less seen as looking out for themselves and taking little consideration for the needs of others. And how often do you question the motives of those who throw their great wealth around? Doesn’t it seem like there are often strings attached? That they have an ulterior motive for using their money? Riches are fleeting. They could be with us one minute and gone the next. And of course we know that we can’t take riches with us once we leave this world at the time of our death. A good name however is theoretically eternal. How many men and women of history are still being spoken of in a positive light? Wouldn’t it be special if that could be you? How will your legacy be remembered and portrayed by family, friends or colleagues once you are gone? Will they focus on the value of your good name or only remember that you cared about money? One of those will provide fonder memories and produce more positive future dialogue than the other. The ending phrase of Proverbs 22:1 says, “…loving favor rather than silver and gold.” As we are to seek a good name instead of riches, so we are also to seek loving favor over riches. And I can think of no better way to garner loving favor than to have a good name. People will love you for having integrity. They appreciate you for the kindness, mercy and attention to their needs that you show. They will stay by your side when you are attacked. And let’s be honest – we all would prefer to be loved, right? “I want to be loved” is one truism to which we can all relate. While riches we could live without, a life that doesn’t experience love would be devastating. In conclusion, riches are not evil and there is nothing wrong with having them. 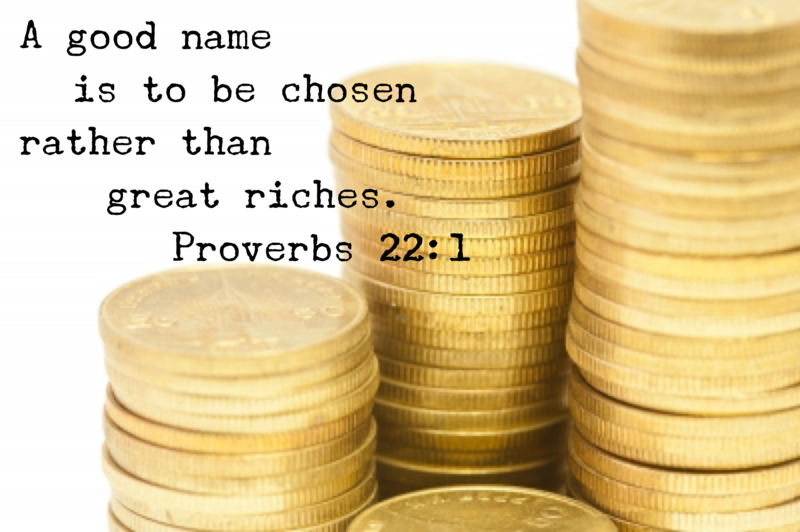 But a good name is better than riches, better than all the riches of the world. It provides more value in the present and the future. Do you need to start working on yours today? Questions for Discussion: Do you believe that a good name is better than riches? Is your name in good standing with those around you? If not, what caused it and how could you turn it around? Have you lost sight of your integrity in the pursuit of riches? How popular is your actual name (click on the link at “most popular first name”)? Thanks Brian for this perspective on “a good name”. Why what people think of us is very important, God’s verdict is final. Our Lord and Savior Jesus Christ was maligned by various persons and religious leaders of His days, however, he remained focus. If someone or group of persons make it a project to assassinate your character do not allow it affect you. If falsehood travels for twenty years the truth will overtake it in one day is a popular adage in my local community. Keep living according to biblical principles and those that de-advertise you will swallow their words at the appropriate time. ” If someone or group of persons make it a project to assassinate your character do not allow it affect you.” You are absolutely right Jesse. But this is so hard, especially when it ends up being people who a) you respect and b) people you thought were friends. In the end, you can’t control what people say about you. They will be held accountable for their own actions one day. It’s not for me to judge why they say or act the way they do. I enjoyed everything about this message, especially the 3 reasons stated above about a good name according to the scriptures, is better than riches. But My question is: what about those who you haven’t faulted, circumvented or stolen from before, yet your name have been soiled for no reasons without your knowledge and you have no way to defend yourself, because someone had sowed a wrong seed in the tour name within a forum, community or circle and you don’t have any idea, all you observe is rejections, unkept promises, even when those who aren’t experienced are given the opportunity and they failed and it’s still not a problem, and yet favored. This scenario could be because someone who feels intimidated by your personality, either because the person is more intelligent, experience or more acceptable to people in that circle, and they have access to the forum and realized that if you are presented positively to the key persons in that forum, community or circle you will be made the head, or controller of some projects which they will have to serve you. Therefore, to prevent that from coming your ways, they will move ahead of you and sow a wrong seed in your name and people just seeing you around with all bunch of ideas and as a problem solver, yet avoid dealing with you or giving you a chance or even told you of your crimes. How do we address this? And where do you start finding the negativity when there’s no dealings with you. Hey Manny…thanks for the comment. The situation you present is a real tough scenario. I guess my encouragement and advice to you would be to live your life in a way that contradicts what is being said about you. If someone spreads false accusations about your character to a group of people, you can’t control that. And, it makes sense that that group may be hesitant to deal with you initially. However, if the group sees through their own personal interactions with you, that you do not demonstrate the qualities being spread around by the accuser, they will probably reject what was said about you in the first place. Your actions will speak louder than someone else’s words. And, my guess would be that the initial accusations would come to light eventually (by the group confronting the accuser) because they will see inconsistencies in how you live vs. what was said about you. Hi Brian, thanks for sharing. You know I am in country that is filled with corruption and this article helps me not to be tempted to tarnish my name for the sake of money or anything. Jayson is common. I used to hate it because there are lots of people whose name is Jayson. But now, I really need to accept and value it so I am doing the best I can do to make my name a reputable one. I just basically do what is right, always. In all, I hope I am building a good name. I agree that a good name has no price. I believe that I have a good name in my community, which I worked hard to cultivate. I am very active in our Church and community and built trusting relationships with my clients. And Michelle is absolutely right – it takes a long time to eliminate negative associations with name/reputation – so I try to be very careful that I don’t do anything damage mine in either God’s or my community’s eyes. “…clear up negative associations with “your person/name”… And in some people’s minds no matter what you do or how much you turn the corner it doesn’t matter. Such is the cost of damaging your character I guess. I hope/plan to never been in that situation.